What Is the DV Soprano Saxophone Mouthpiece? To create the most efficient sax mouthpiece possible. That means that there are more harmonics present in the sound and therefore the projection of this Soprano sax mouthpiece is huge. To eliminate the annoying shrillness that is associated with loud bright soprano saxophone mouthpieces. To have a big fat midrange and bottom end that has never been present before in a soprano sax mouthpiece with strong projection. Ed Calle Plays DV Soprano Sax Mouthpiece. Performing a semi-classical piece with Negroni. The new facing curve results in absolutely no dead spots in the vibration of the reed. In other words all notes in all ranges respond equally. This Metal Soprano sax mouthpiece has a warm tone while being able to sing and soar over the top of any band. Sub toning and low notes are extremely easy and Intonation is spot on. To my knowledge, there is no other soprano saxophone mouthpiece that blows like the DV. Most soprano sax mouthpieces have back pressure when play them but the DV soprano will let you play it like your alto or tenor. Be prepared to have possibly the most fun you ever have had on the saxophone. I have found that many straight ahead jazz players who tend to favor mouthpieces that are just a little brighter than most mainstream dark mouthpieces have a very high chance of making the DV their new Soprano sax mouthpiece. We have had many many converts who came from playing the most popular hard rubber Jazz piece. These players almost always think that they won't like a metal Soprano mouthpiece and they are surprised everytime. Due to the free blowing nature because of the facing curve of the DV soprano and all the DV's , be prepared to use a harder reed than you normally do. This may or may not be the case for you. The great benefit of this is that a harder reed lasts longer. A harder reed also helps the altissimo range. For this same reason, you may want to try a slightly more open tip than normal. Tuning: When you first try the DV Soprano I recommend that you push the mouthpiece on the neck until you see a little bit of the neck peeking through the secondary window. This may or may not be the correct position for you but I want to make sure that you start playing near where the mouthpiece will probably go on the neck. "Dear Jody. I will try to contain my list of superlatives so I don't sound like I'm gushing. When I first pulled it out of the packaging, I thought it was perfect in every examination of the workmanship. I put the mouthpiece where you told me to just to where the neck begun to peek through. The pitches were DEAD on bottom to top. This is the free-est blowing soprano sax mouthpiece EVER.. I might end up with a slightly stiffer reed even though this is the most open mouthpiece I have ever used. 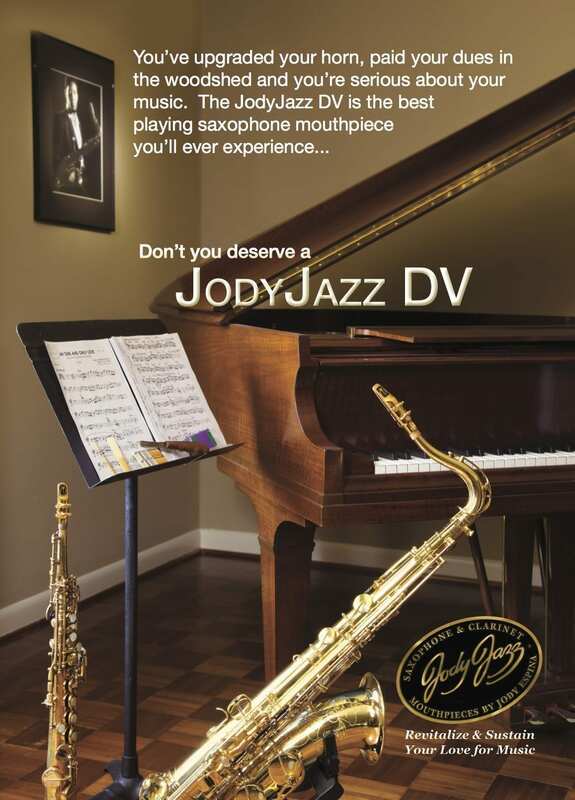 Jody-YOU are the Leonardo DaVinci of the saxophone mouthpiece. You have revolutionized sax playing and now especially soprano playing. Adolphe Sax MUST be smiling down on you. Congratulations,Your mouthpieces and way of doing business are without equal." since a few days I received your mouthpiece and, lo and behold, the Jupiter 767 is beginning to sound as a real Soprano! As soon as I got your beautifully crafted piece, I went through all the reeds that after the usual long adjustment period, were just starting to break in, and to my surprise, especially using the harder ones, I was not only able to play up to the G higher note, but the sound was quite good and a perfect intonation! I should have expected it from your art works! Now with the DV on the Soprano I was finally able to play that register without too much trouble, if not for my inner ear! Thank You very much, you are a Genius (so much as the Da Vinci of sax mpc !"